A prospective community-based study of almost half a million people in the UK has identified new clinical and genetic determi­nants of varicose veins, including increased height, reports new research in Circulation. The author of an accompanying editorial described the study as ‘the largest and most comprehensive epidemiologic and genetic study of varicose veins to date,’ and complimented the authors on this important contribution. Speaking to Medicine Today, Associate Professor Laurencia Villalba, Head, Vascular Surgery, Illawarra and Shoalhaven Health District, NSW, and founder of the Vascular Care Centre in Wollongong, said the study was ‘a game-changer’. Using data from 493,519 individuals in the UK Biobank – a nationwide longitudinal cohort study of 40 to 69-year-olds – and a range of different methods including machine learning analyses, researchers identified several risk factors for varicose veins. These included the accepted factors of age, obesity, pregnancy and history of deep vein thrombosis (DVT), previously debatable predictors such as hormone replacement therapy and length of educa­tion, and novel factors such as history of cellulitis and surgery on leg arteries. 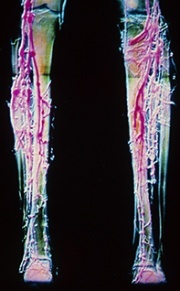 Increased height and leg bioimpe­dance were both independently associated with varicose vein risk, suggesting a link between high-volume venous reflux, increased hydrostatic pressure and resulting venous hypertension, the researchers wrote. Mendelian randomisa­tion confirmed a causal role of greater height in varicose vein development, and a strong genetic correla­tion between varicose veins and DVT was also demonstrated. The authors said their study substantially extended unders­tanding of the genetic and environmental bases of varicose veins, setting a path for identification of new therapeutic targets. Circulation 2018; 138: 00-00; doi: 10.1161/CIRCULATIONAHA.118.035584. Circulation 2018; 138: 00-00; doi: 10.1161/CIRCULATIONAHA.118.037219.